Join us this weekend for a double store tasting! Friday we will have open 3 Organic cool wines, a white blend from Spain, a Lambrusco sparkling red from Italy and a modern Rioja Tempranillo red from Spain! On Saturday, we will showcase three upstate New York spirits: a Bitter and Gin from Buffalo + a Vodka from Albany!! 50% Xarel-lo, 50% Parrellada from Penedes, just west of Barcelona. Biodynamic, native yeast, no added SO2, unfined, unfiltered (hence the cloudy appearance). From estate vineyards of calcareous clay soils. Vines between 10-25 years old. The vineyard is not tilled, this is true minimal intervention agriculture. The objective is to have the highest variety life in the soil and create a natural balance within the environment. Manual harvest in 10 kg boxes, with selection of the grapes in the vineyard. Grapes are chilled then pressed. Fermentation in stainless steel with indigenous yeasts and no additions. No SO2 added. Lime zest, peaches, apple skin, with a stiff mineral streak and zippy acidity. Notes of apple skin and walnut on the finish. Amilcare Alberici dresses in green coveralls and socks and sandals. He has farmer hands. He smiles often. He speaks Italian sotto voce with short spaces between syllables. Alberici’s daughter Arianna is more direct, emotive, easier to follow. Arianna plays the viola, which isn’t surprising. She is a creative, positive force at the estate. Her family are all heart: they exude sincerity. The Casalone farm is on a floodplain of the Po River in Reggio Emilia, close to a nondescript highway overpass. The area is called Pianura Padana, the nearest town is Gualtieri. The nickname of their little hamlet is “Giardino” or garden. A short row of blue beehives sits in the driveway, in front of low trellises of Lambrusco Salomino and Fogarina vines. Eleven hectares of vines surround the estate’s small cluster of buildings: house, cellar and barn. 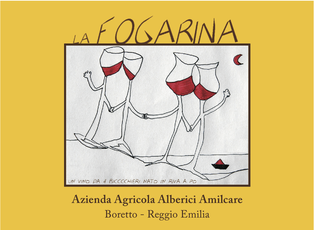 The red and black flag on the Fogarina label are the colors of Italian anarchists, a dedication to the memory of family friend Luigi Veronelli, who encouraged Amilcare to produce La Fogarina. This abandoned vineyard of 60-year-old vines was brought back to life by Alberici and his cousin Joseph Caleffi, beginning with the 2002 vintage. The duo even had to get Fogarina officially listed with the regional registry of permissible grape varieties: it was nearly extinct. Organic. 100% estate-grown fruit. Made from 85% Fogarina and 15% Ancellota from 60 year old vines. Frizzante and dry, between 10 and 11.5 percent alcohol in a typical vintage. Hand-harvested in mid-October. The wine rests in tank from harvest until February or March of the following year, then goes through a slow, natural fermentation in bottle. 4000 btls produced annually. Luís Palacio’s father planted the first certified organic vineyard in Rioja in 1980, and quickly converted the rest of his family’s holding when he saw the results. Three decades later, Luís has the most beautiful vineyards in Rioja—pools of green life in a desert of red clay. A plot of 150 year-old own-rooted graciano and tempranillo peludo vines provide the genetic material for four generations of vineyards, the last of which Luís planted himself. His debonair wine reflects the simple genius of generations of patience and observation—distinctive fruit, thoughtfully presented. Certified Organic. 100% Tempranillo. From hillside vineyards planted in 1989 and farmed organically since their inception in Rioja Alavesa in clay/limestone soils. Pruning: goblet. Hand-picked, sorted, and pressed. Spontaneous fermentation in stainless steel but the wine is racked off the skins before fermentation is complete to limit tannin extraction. After a quick ageing in stainless steel the wine is bottled with little to no SO2 depending on the vintage. No filtration or cold stabilization. The Albany Distilling Company is a modest operation, producing craft spirits one small batch at a time. It is located in downtown Albany, not far from the site of the city’s original 18th century distillery. Owners John Curtin and Matthew Jager are proud to be a part of New York State’s rich heritage of spirit production. Made from American corn and distilled six times before being meticulously blended and run through charcoal filters, ALB Vodka is clean and crisp with a touch of sweetness. Neutral enough to be shaken into a cocktail and smooth enough to drink on the rocks. Lockhouse Ibisco Bitter Liqueur – Campari-red in color with a distinct orange peel overtone to go along with an ample sugar character. On the palate, the sweetness hits first, a simple honey/syrup character, before the bitterness grips your palate like a vise. Bitter orange peel, traditional bitter roots, and some sour cherry notes. As the finish emerges, notes of rhubarb and grapefruit start to emerge, ending things on a lingering note that’s more bitter than sweet. Ibisco bitter is very cocktail friendly. Next Post October 19, 2018 – 4 Fall wines to fall for! And a Local Whiskey Tasting on Saturday!